Home » comic books , movies , nicolas cage , superman » Is this Nicolas Cage as Superman?!? Is this Nicolas Cage as Superman?!? That's what GeekTyrant is wondering (and has Twitter-ed that sources are confirming). 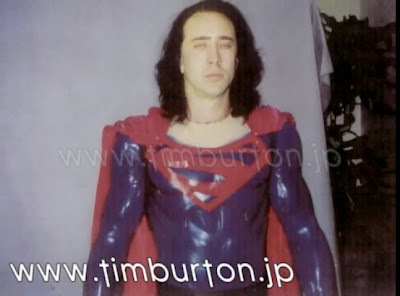 This does indeed appear to be Nicolas Cage in a costume test for the Superman movie that Tim Burton almost began production of in early 1998. That would make this photo around twelve years old... which jibes with Cage's current age. "Nicolas Cage, having been fighting tooth and nail against Burton and [Jon] Peters' vision of Superman (even though he'd been putting on a happy public face about working with them), angrily demanded that he be allowed to wear the classic Superman costume and fly. So WB relented much to Burton's dismay, ordering up a rubber Superman suit and flying FX tests. (A chintzy, Sam Jones-as-Flash Gordon-type Superman suit was dished up, but it went over like a lead balloon.) However, when Cage tried on the rubber suit, it looked stupid. And when they stuck a long-haired wig on him, it looked even worse." Some are saying this might be a Photoshop job. Personally, I think it fits well with the evidence.